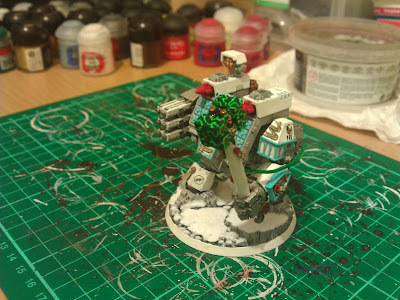 This project that we started was great as it gave me impitus to get on and paint something. 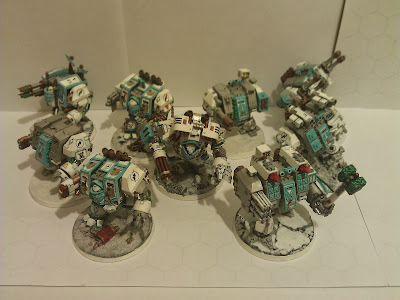 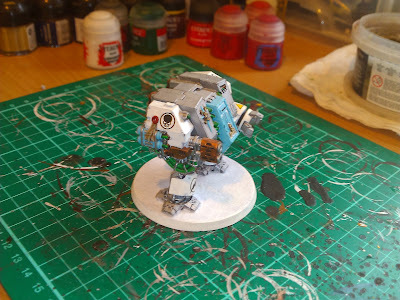 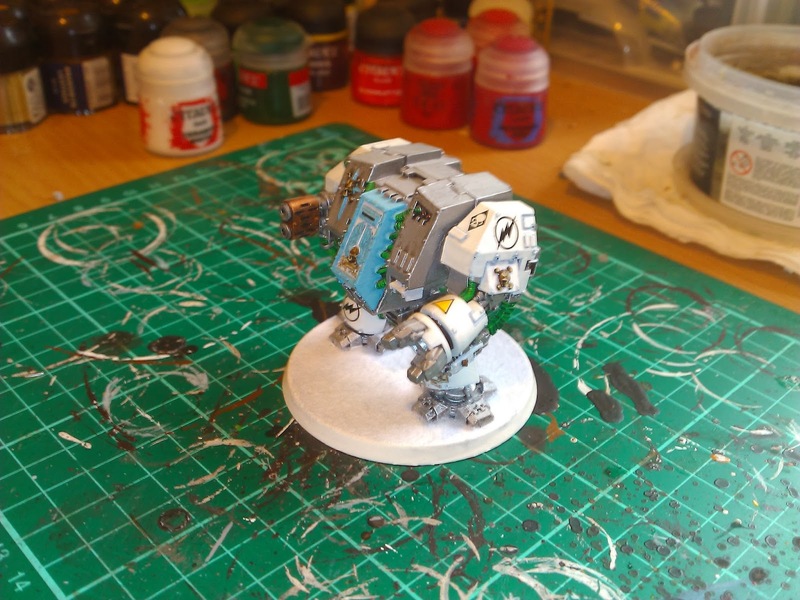 I have already painted 6 dreadnaughts for a previous tournament last year. They were part of a drop pod list which worked surprisingly well. 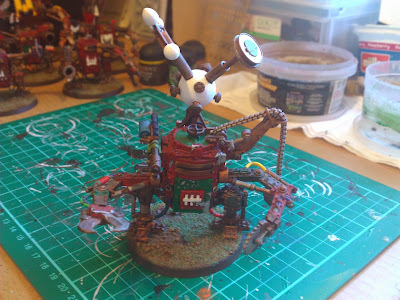 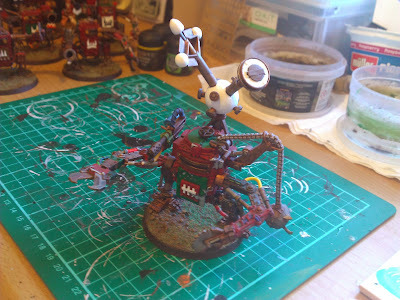 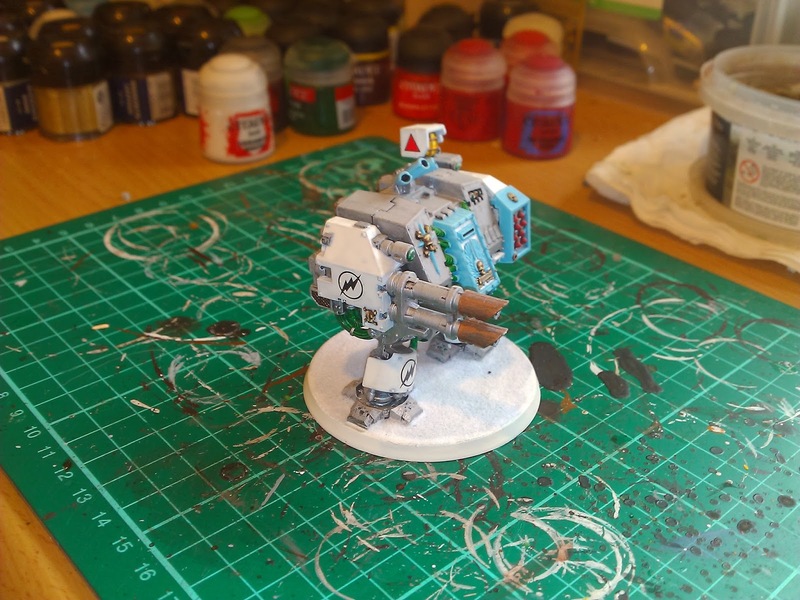 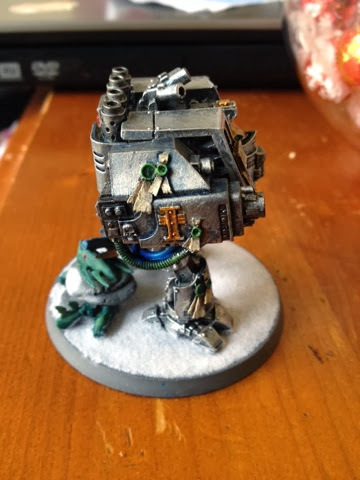 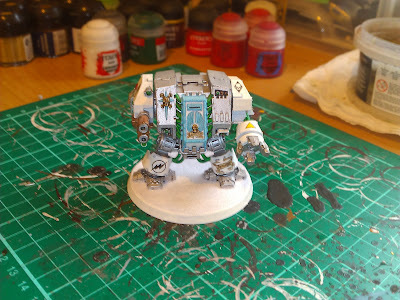 The work with the dreads and the new marine codex (inc forgeworld) updates I quite fancy the salamander hq dread in a Lucius drop pod. I have a few plans to set in motion for the upcoming Worcester War 2 in February. 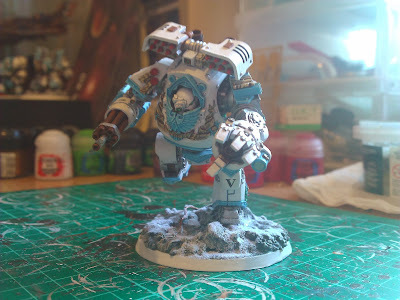 I don't like leaving something until the last minute but at this crazy time of year it couldn't be helped. 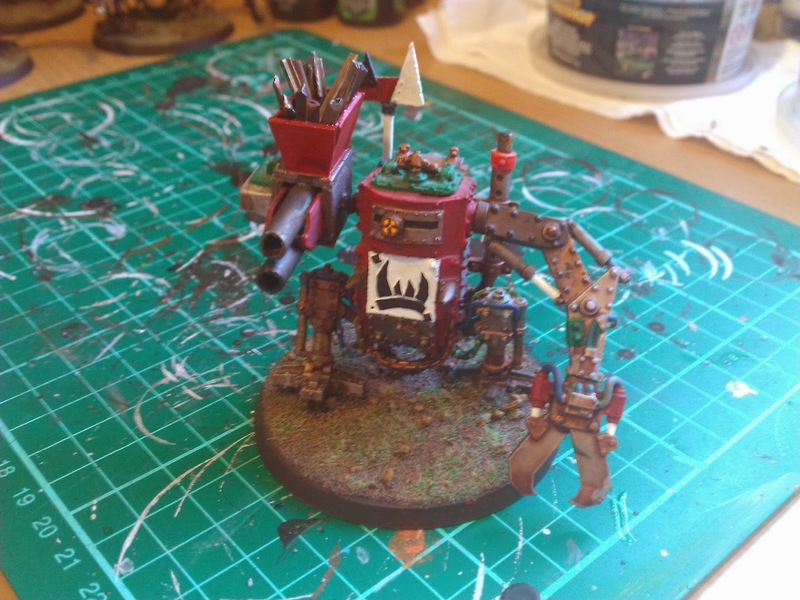 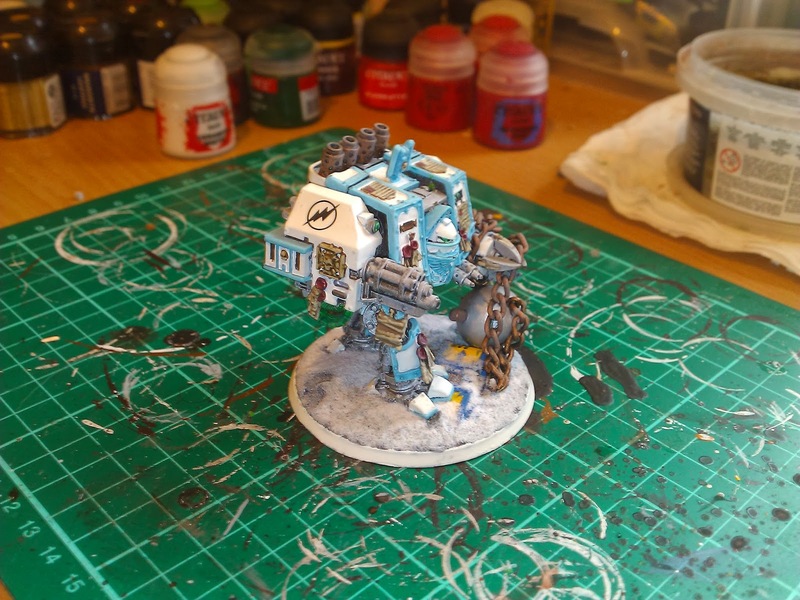 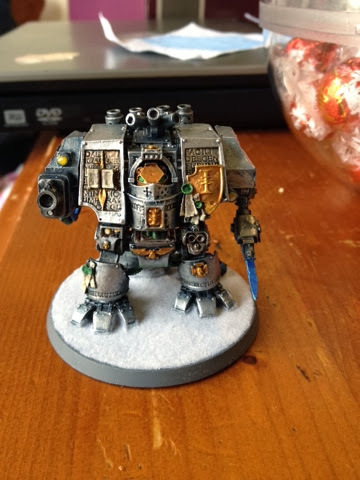 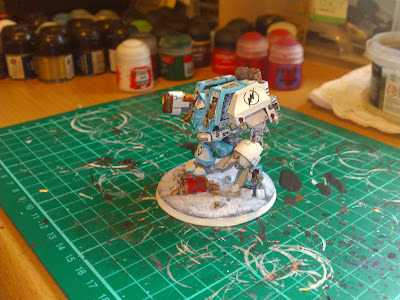 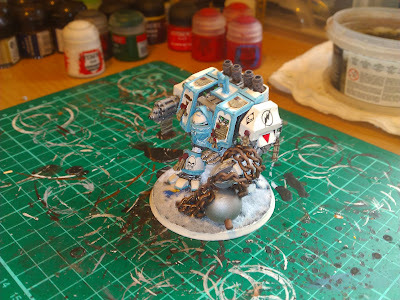 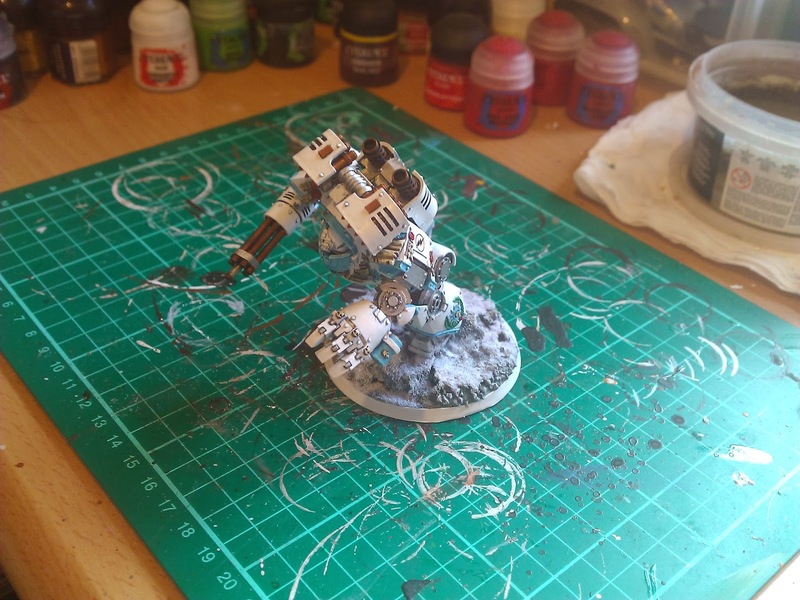 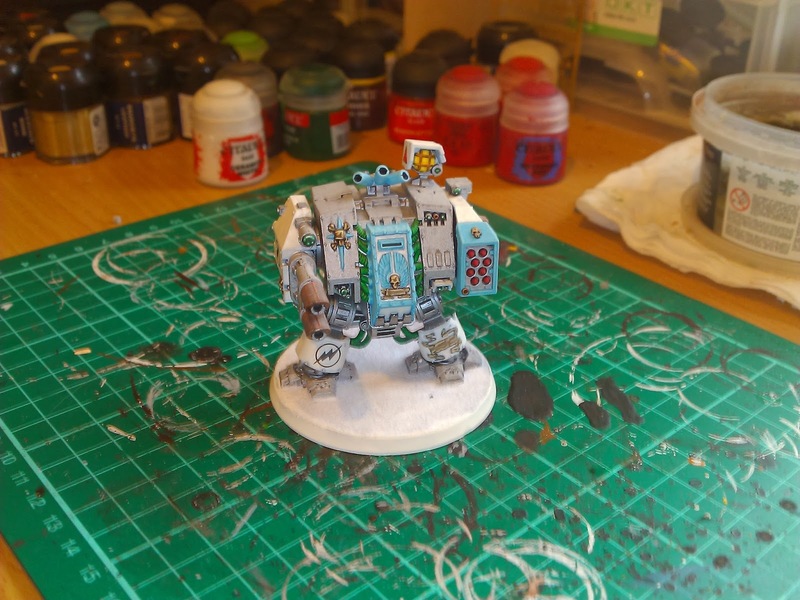 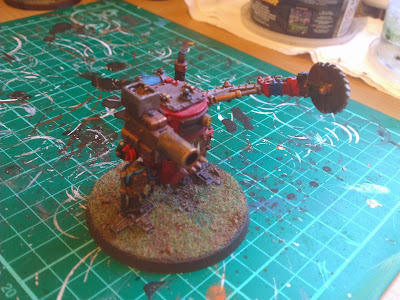 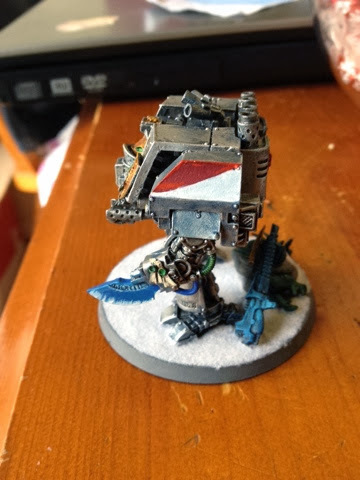 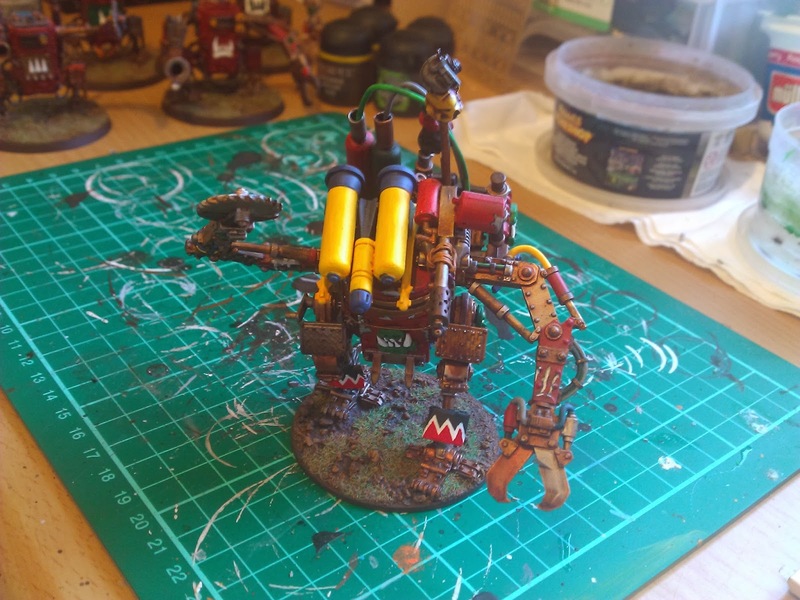 I have completed the Grey Knight Dread. 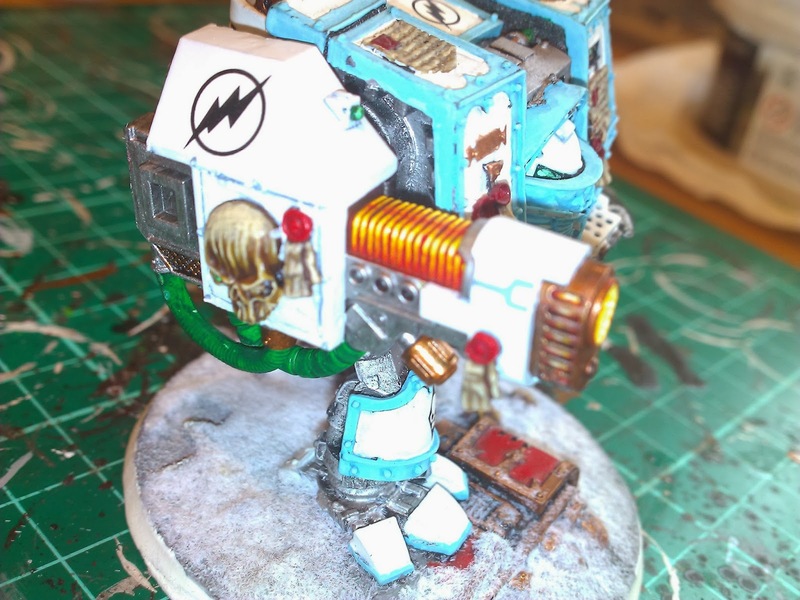 I generally keep a small amount of colours to a model but I have tried to make the force weapon look a little more psychic. 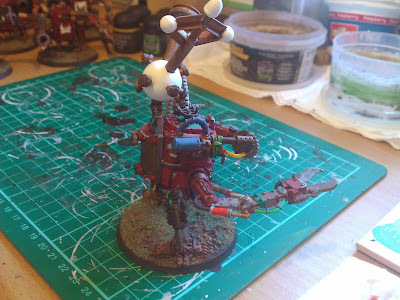 There is also the Dark eldar "in bits"
Dread-Full December, Waaaghh! Bluddtoof, Ork Kanz and Dreads. So here's my final entry into Dread-Full December; the Dreads and Kanz of Waaghh! 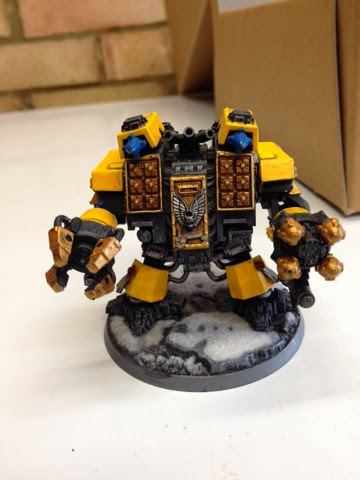 Bluddtoof! 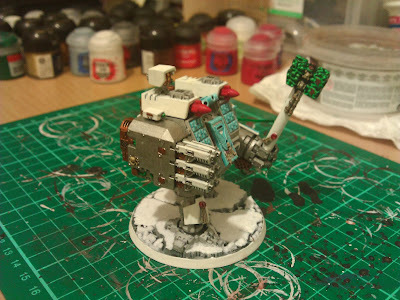 Now that that's done, time for me to start on my Grot Tanks! Huzzah! Merry Christmas to you all and see you all in 2014! 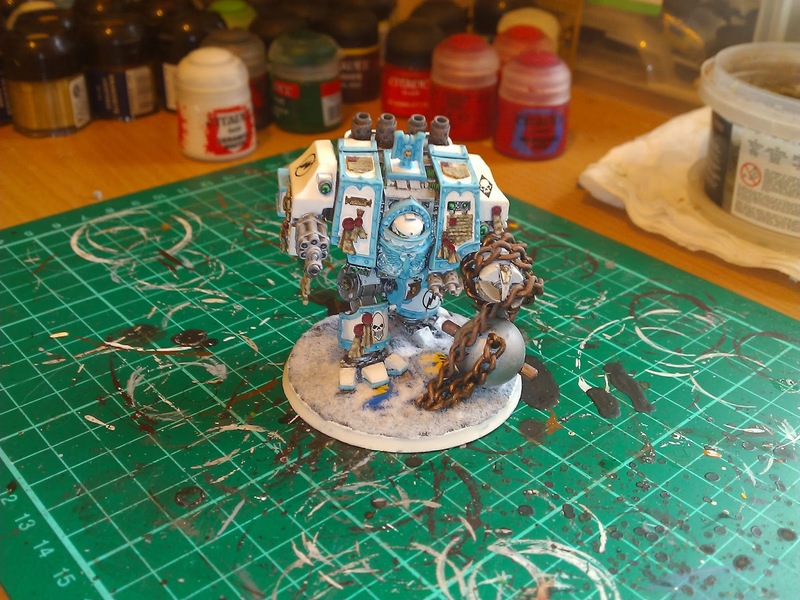 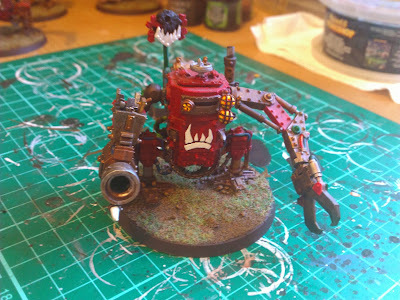 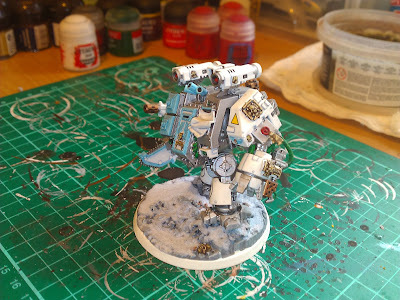 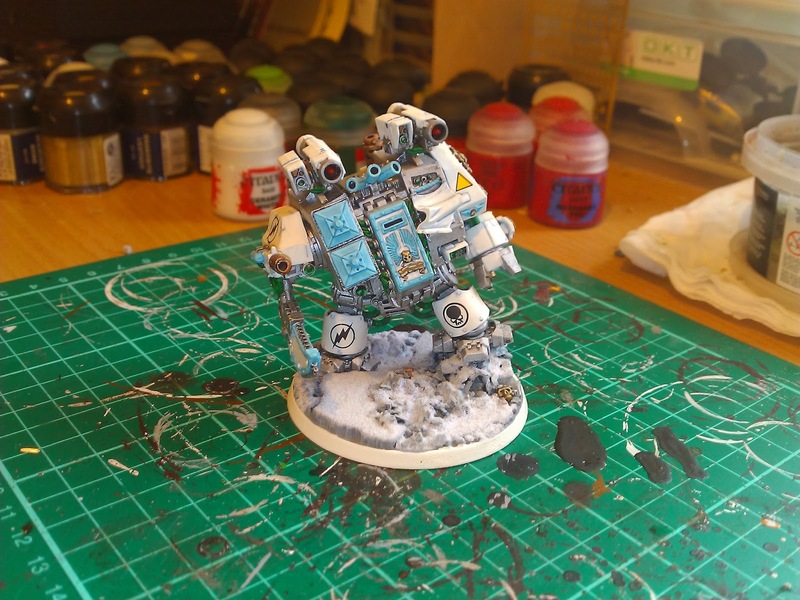 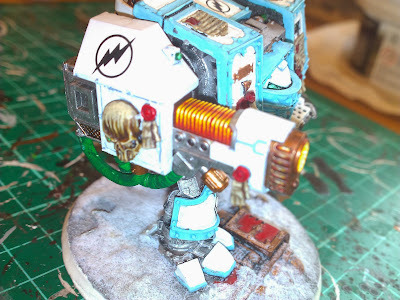 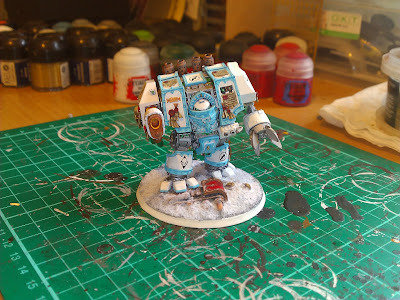 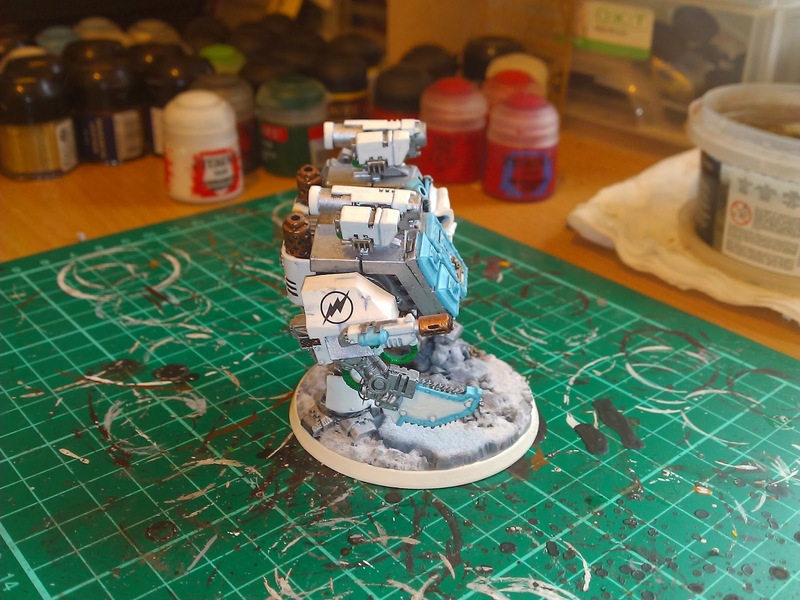 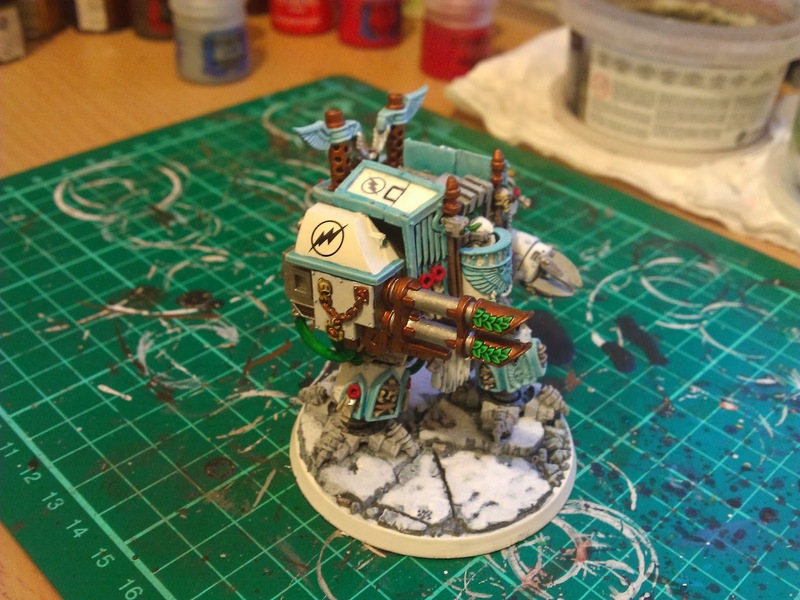 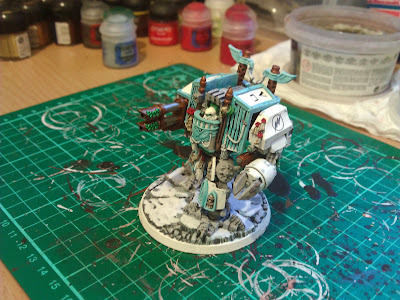 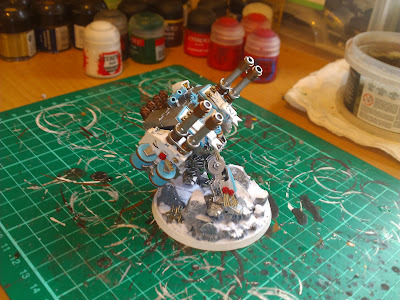 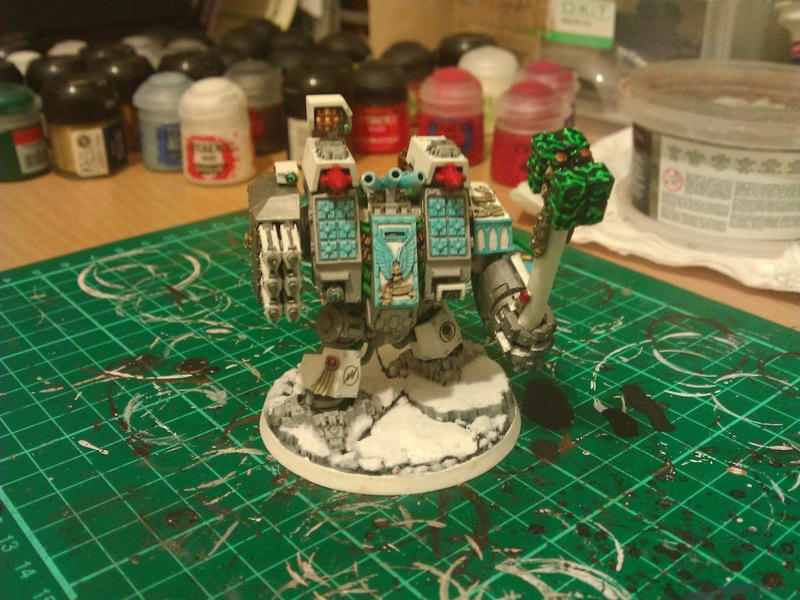 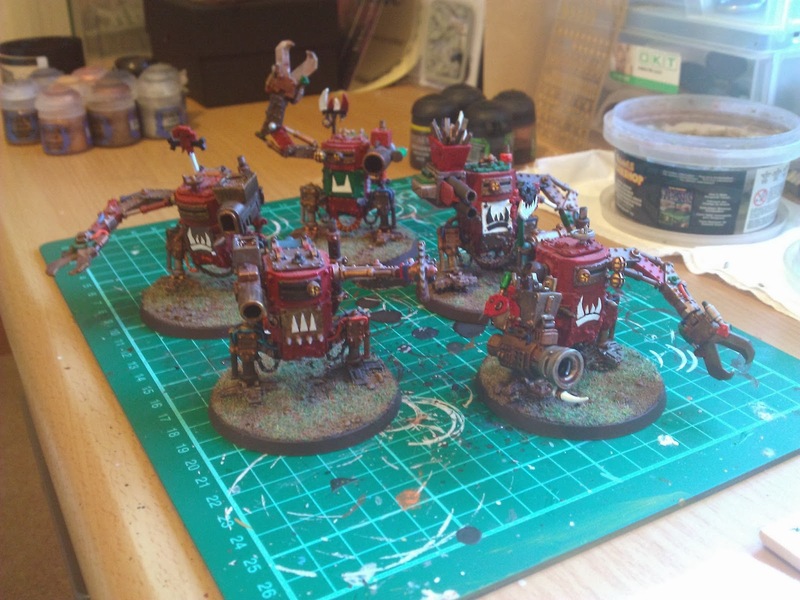 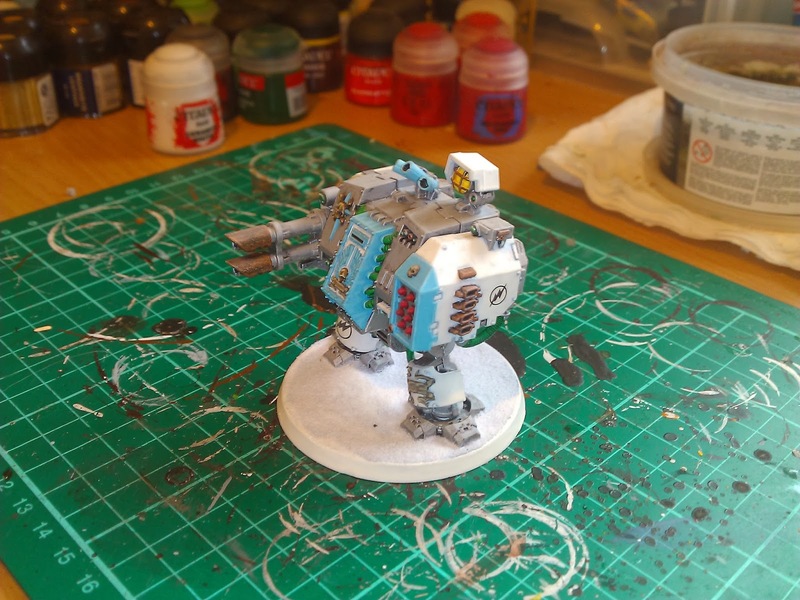 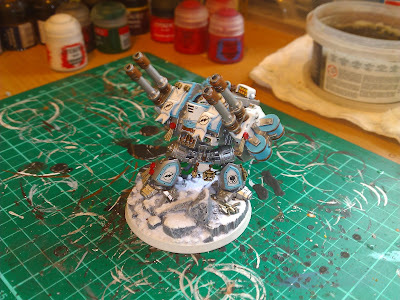 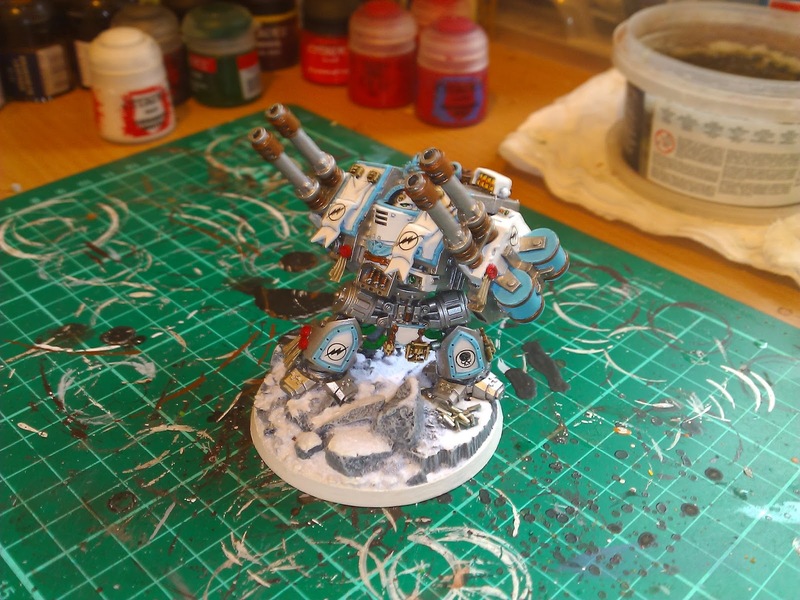 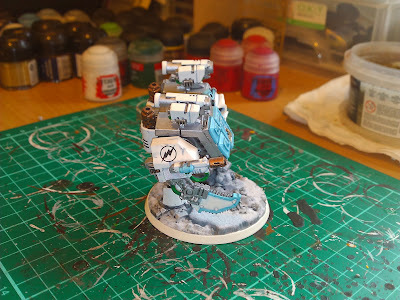 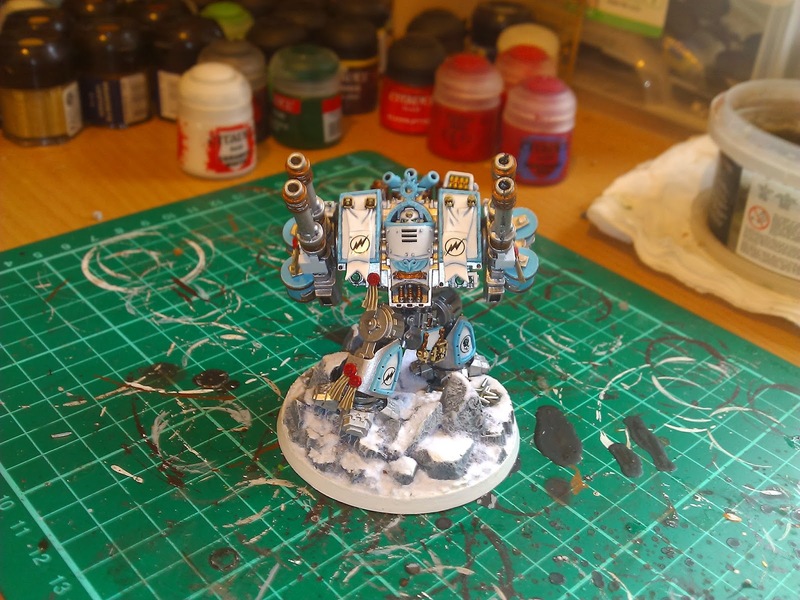 Continuing with the Dread-full December theme, here are the rest of my Marine Dreadnoughts. 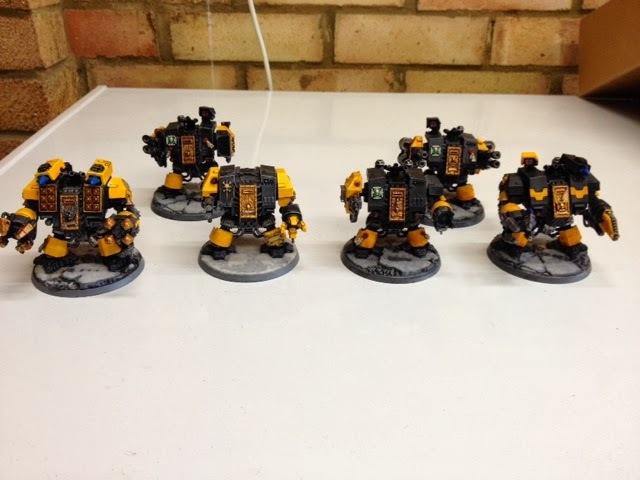 Along with my new Contemptor these make up my 9 strong Ancients Assault Force. 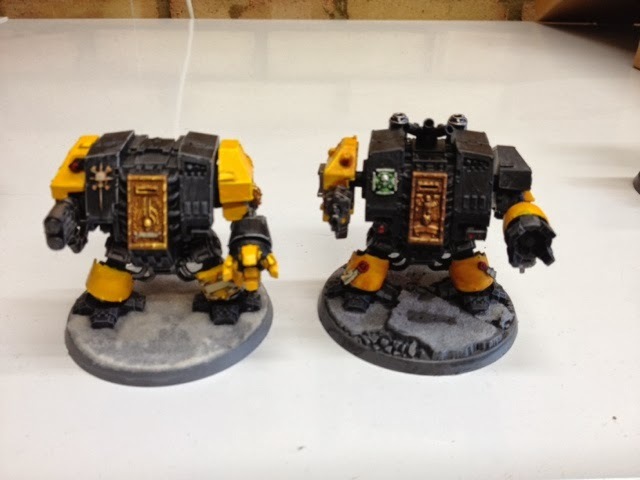 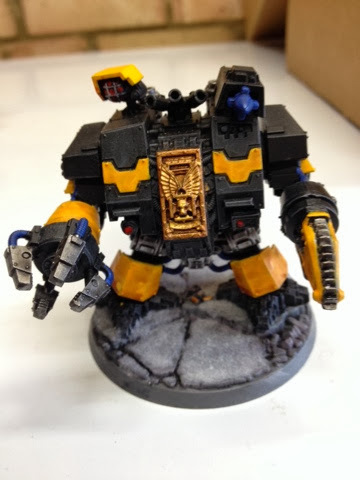 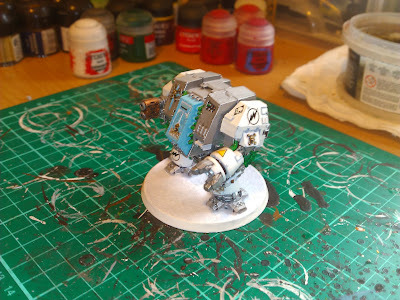 As you can tell I like Dreadnoughts, I plan to build a Mortis pattern Contemptor too in the future, probably with Quad Lascannons and I have the remains of an old metal venerable left after all my recent conversion work, he'll get some new arms when I've decided what I want him to have. 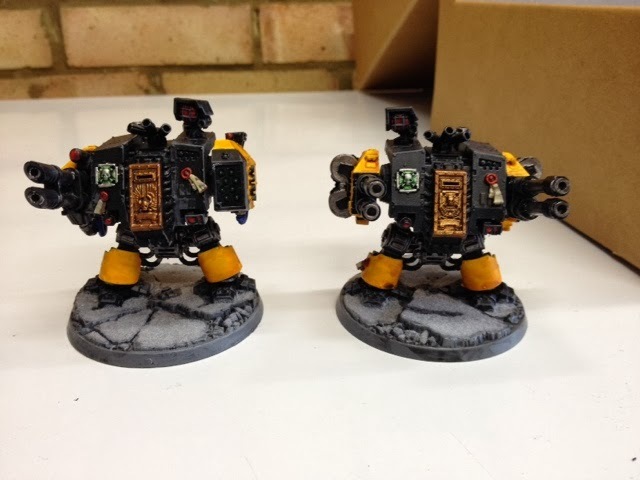 As I've been touching up and converting these models recently it's become apparent how much my painting style has changed over the years since I started the Thunderbolts, how much I've improved but also how marked the changes in the GW paint range have been. 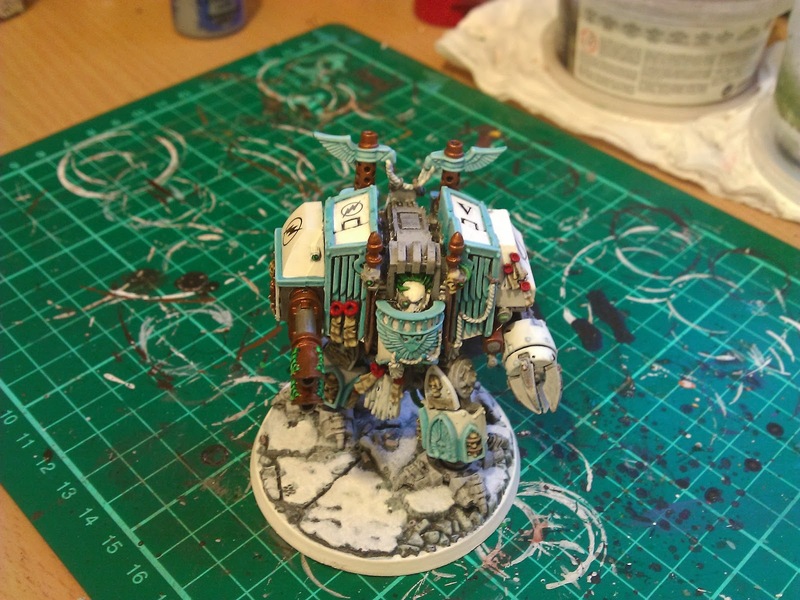 Originally I used Ice Blue, now I use Lothern Blue, I'm carefully nursing my last bottle of Dark Angels Green because its' replacement; Caliban Green is totally different, when mixed with white, for highlights, it produces a much greyer tone. 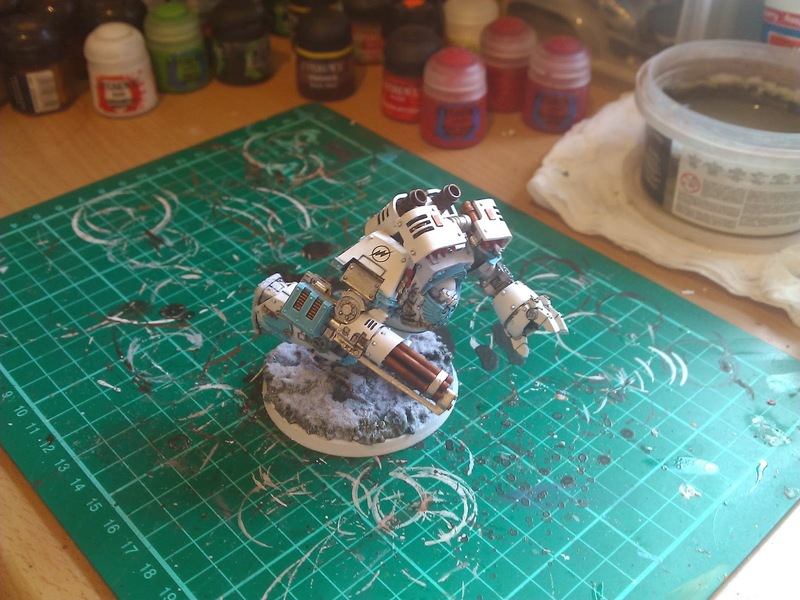 On the other hand Ceramite White is far superior to Skull White, giving better opacity and coverage and a much brighter finish. The brass has changed from the original Dwarf Bronze through Brazen Brass to a newer Dwarf Bronze and back to a newer Brazen Brass and is now the new Brass Scorpion. 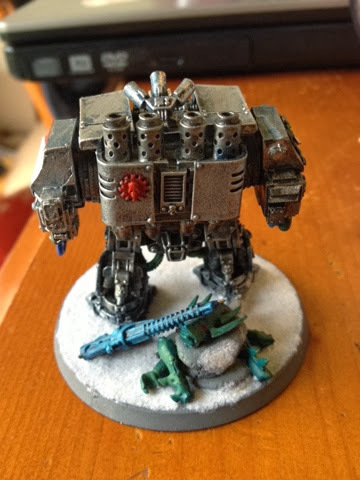 Don't even get me started on red! Suffice to say I'm now using the 3 new shades of red in layers, most notably on my Techmarines all of whom are either new builds or were stripped and repainted recently in the new reds. 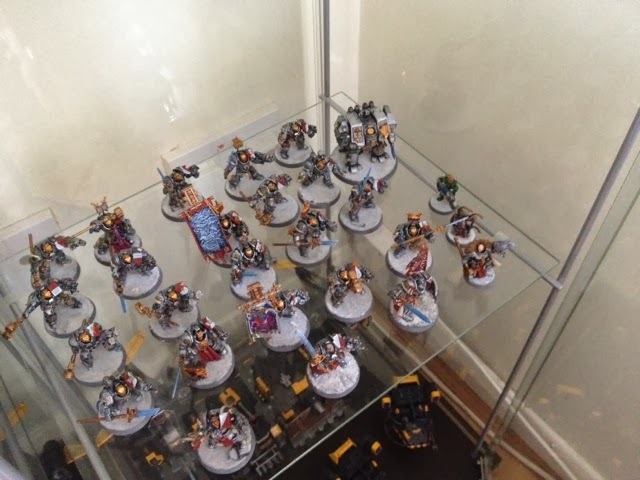 So that's it for now. 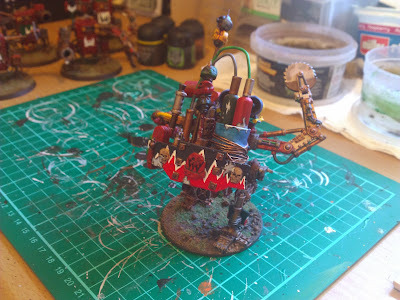 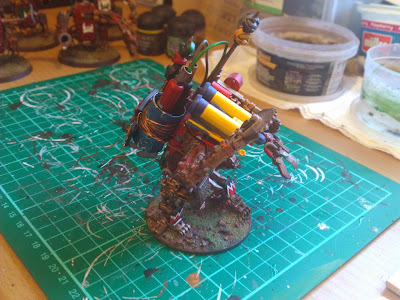 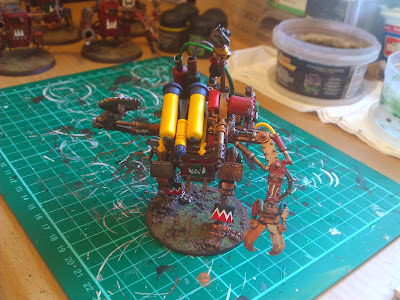 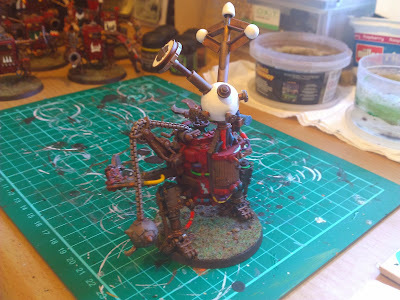 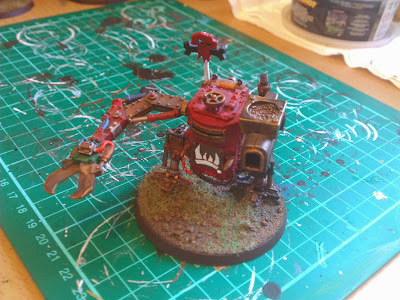 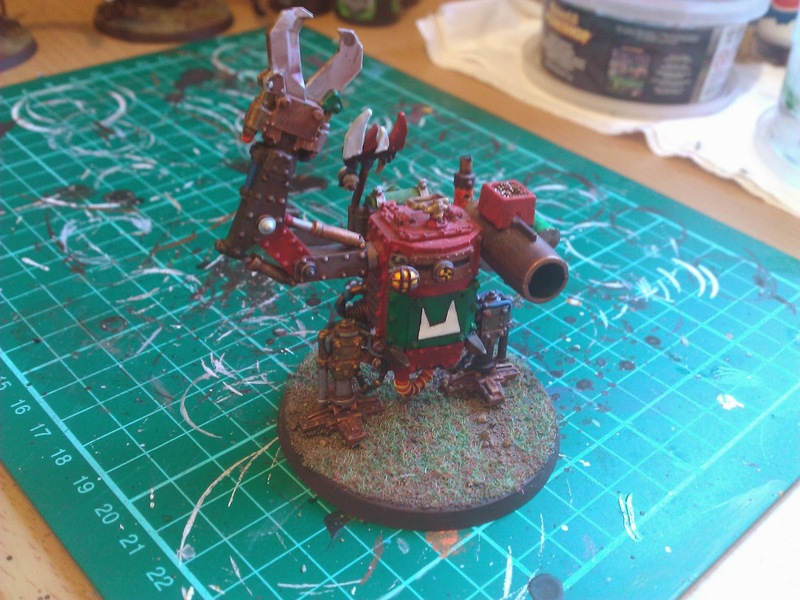 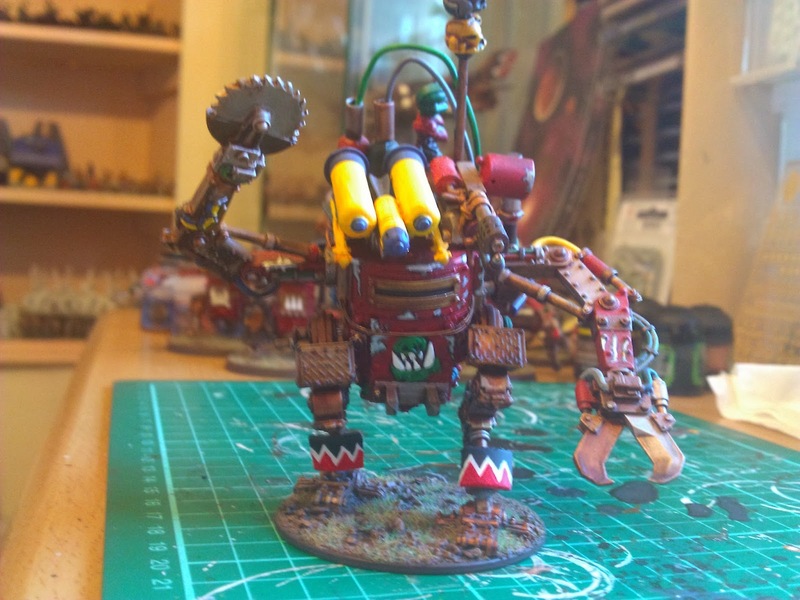 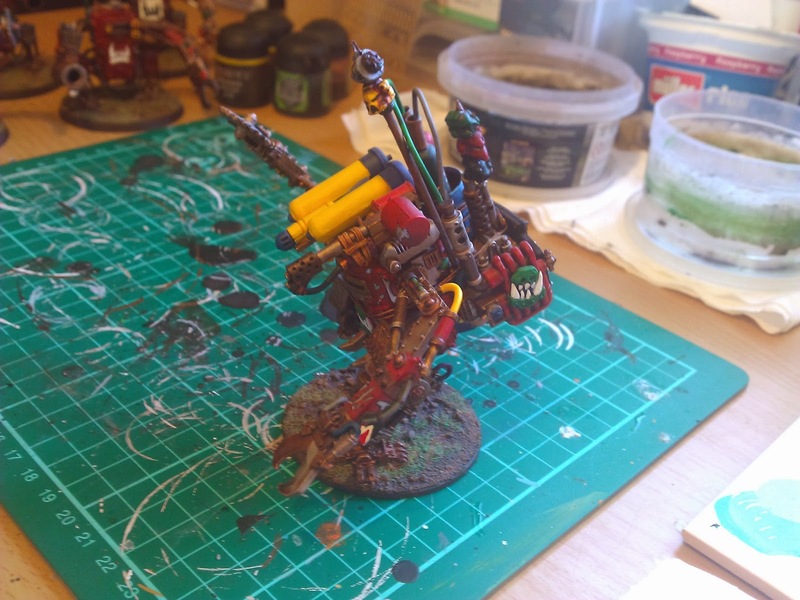 I'll be posting some pics of my existing Ork walkers soon as part of Dread-full December.